Meeta Cesler-Maloney (l) and Angela Sabo (r) of IU Southeast savor the fruits of victory at the IU Undergraduate Research Conference in Indianapolis, Ind. (NEW ALBANY, Ind. )–IU Southeast Natural Sciences students Meeta Cesler-Maloney and Angela Sabo won top honors at the 2017 IU Undergraduate Research Conference (IUURC) in Indianapolis, Ind. on Friday, Nov. 17. The women’s 1-2 capped a strong overall showing by Grenadier undergraduates, who made up nearly half of all entrants with 72 students and 52 presentations. The IUURC, established in 1994, is dedicated to promoting undergraduate research, scholarship and creative activity in all fields of study performed in partnership with faculty or other mentors as a vital component of an Indiana University undergraduate education. 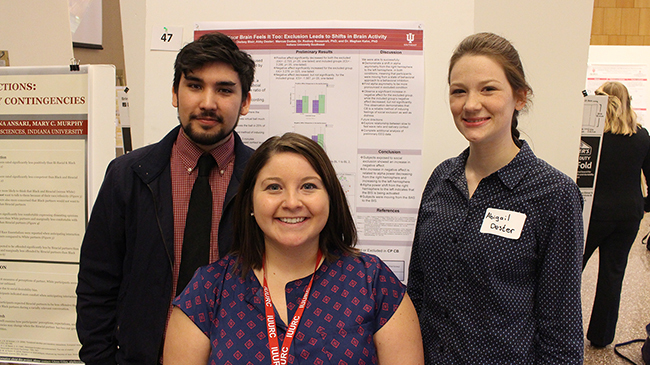 The annual conference gives undergraduates from across the IU system an opportunity to present their research via oral and poster presentations. Marcus Dudas, Chelsey Blair and Abigail Dester were among 72 IU Southeast students presenting their work at the IU Undergraduate Research Conference. Cesler-Maloney and Sabo were two of five finalists in the competition, which involved a five-minute oral presentation before judges and a short essay, in addition to the standard 10-minute public presentation. For the competition, Cesler-Maloney worked with research advisor Dr. John Halfacre, assistant professor of chemistry, to present the pith of her research, and name its overarching importance while resisting the temptation to go into specifics. “The ability to communicate science to a wide range of audiences is a critical skill that is often under-emphasized in many undergraduate and graduate science programs,” Halfacre said. “As public skepticism of science increases, it is more important than ever that we scientists learn and teach how to more effectively explain exactly what it is we’re doing, why, and how it affects them. Cesler-Maloney, a senior from Louisville majoring in geology and chemistry, examined the impact of ozone depletion on the lifetime of pollution in the Arctic atmosphere. Cesler-Maloney intends to pursue a graduate degree in chemistry, and seek out a post-doctoral position at a university or research institute where her skills may contribute to advances in atmospheric chemistry. Sabo, a senior from Mitchell, Ind. majoring in biology, studied phages, viruses that infect and kill bacteria. Embedded in her research, she had little time for pre-competition jitters. In the end she was well prepared, having refined her slides several times and given several rehearsal talks to tailor her presentation to each audience, according to her faculty mentor, Pam Connerly, associate professor of biology. Sabo is convinced that her research has broad applications, a factor that translated well during the competition. Phages are the most abundant of biological organisms, and are becoming useful in many fields, including medicine, where their bacteria-killing properties hold some potential benefit in an age of mounting resistance to antibiotics. Sabo has applied to several graduate schools, in programs ranging from microbiology and molecular genetics to cellular and molecular biology. Her determination, like that of all the student researchers, is a source of inspiration for her instructors, according to Connerly. The actual prize presentation was packed with drama, as the field was narrowed from five finalists to three, then two, then one. The women accepted applause and their awards, emblazoned on symbolic cheques. First prize was worth $500, and second prize was worth $300. 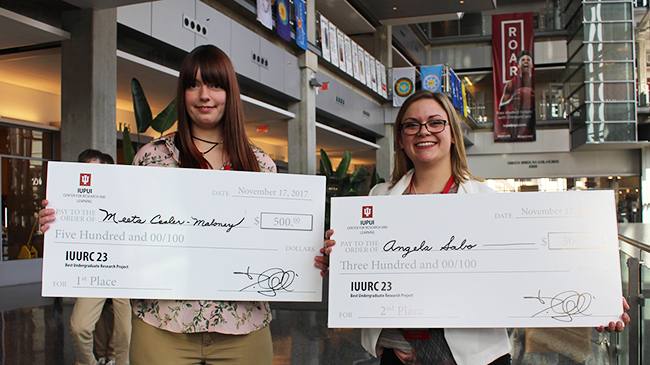 Homepage photo: Meeta Cesler-Maloney (l) and Angela Sabo (r) celebrate victory at the 2017 Indiana University Undergraduate Research Conference at IUPUI in Indianapolis, Ind.